We will provide a vehicle and driver to take you between your hotel and start/ finish points of your trek. We provide all essential camping equipment except sleeping bag. This includes a mess tent with tables and chairs and all dining equipment complete with lighting for the evening. You'll have good quality 3 man tents for sleeping a maximum of 2 people so there’s plenty of room. Private toilet and toilet paper. We have dedicated and talented chefs who will provide all your meals whilst on trek. You’ll have 3 meals a day - a hearty breakfast, lunch, which will be a hot or packed lunch that you’ll carry with you depending on the days trek. In the evenings you’ll have a 3 course dinner. Additionally there will be hot drinks and snacks in the afternoons on arrival at camp. All drinking water which we will filter and purify for you. If for any reason you need to descend from the trek early you will be accompanied by one of your guides to the nearest accessible gate and we will meet you there for any assistance you require. However, there will additional costs for transfers and accommodation. If it's for medical reasons we will assist and accompany you to the hospital. Keep any receipts for your insurance company. 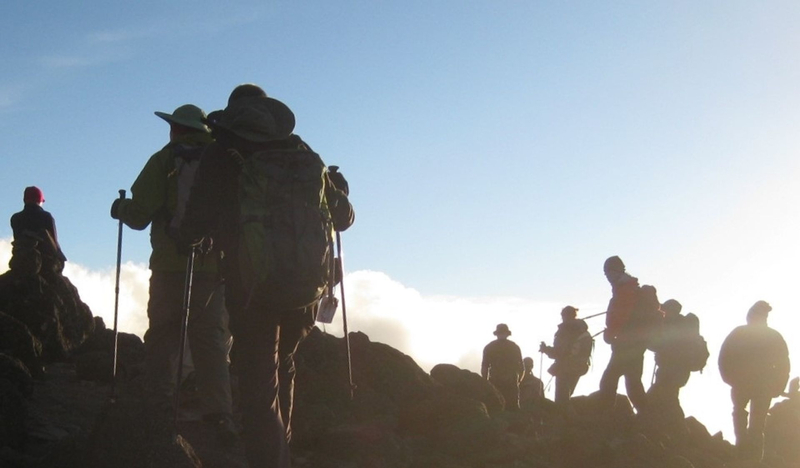 Undertaking a climb of Kilimanjaro is a proper mountain expedition and as your crew have to carry everything from the gate all the way round and up to your last camp your support team will be quite a large one. You'll have a big support crew for your trek for 2 trekkers typically you'll have 1 head guide an assistant guide, a chef and around 10 porters, some of whom will do additional work, for example, waiter, kitchen assistant, water collectors, tent erectors. And you don’t need to do any work on the mountain our crew will prepare the camp and all equipment ready for your arrival and pack up the camp in the morning after your departure. We hand pick all of our crew so you have the best. Your crew can turn your trek from a punishing slog to a lifetime of unique, happy memories. So we look after our crew -we believe that a happy crew makes a happy trek. 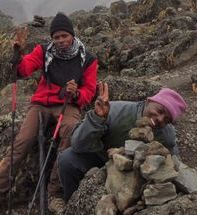 We have supported the work of KPAP (Kilimanjaro Porters Assistance Project) for many years and are committed to raising the standards of porter welfare. The porters are allowed to carry a maximum of 20Kg according to park regulations and we ensure that is strictly adhered to. We also pay over the minimum wage and intend to increase salaries in accordance with the cost of living. Their work is invaluable and must be recognised by paying fair salaries, providing good standards of food, tents and mountain clothing. Your head guide has ultimate responsibility for you and your fellow climbers as well as the crew whilst on the mountain. All our guides are fully licenced by KINAPA. There is a comprehensive training programme and assessment in order to qualify as a guide which includes high altitude first aid and rescue. 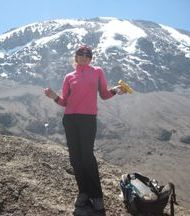 Additionally all our guides have several years of climbing Kilimanjaro and leading expeditions under their belts and have a huge amount of experience to draw upon to make your climb safe and fun. It’s quite simple really – walk, eat, drink, rest, enjoy the mountain and have fun ! Your guide will set the walking pace which will start at a slow pace and get even slower as you ascend. This is essential for your acclimatisation. Over-exerting your body can trigger a.m.s symptoms. Follow your guide's lead ! As you gain altitude, resting when you reach camp becomes more important. It's also essential that you tell your guide how you are feeling so that they can monitor your progress and ensure that you have a safe climb. The only successful climb is one where you return to Moshi in good, vibrant health. You must drink a minimum of 3-4 litres per day for some people probably more. It’s best to have 3 litres of water with you when you start each days trek and try to finish it just before reaching camp. Don't forget to keep drinking throughout the rest of the day and evening as you can easily dehydrate overnight and wake up feeling groggy. You may find adding an electrolyte flavoured powder to your water helps you drink enough. Hot drinks and soups that we will provide you with daily also add to your hydration. Eat while you can and when you feel like you can't – it’s money in the summit bank ! You need a lot of energy to allow your body to make the necessary physiological changes and for the daily treks and especially for summit night. However, loss of appetite and/or nausea is common at high altitudes so you might not feel like eating but you need to try and get as much as you can inside you. It’s often the case that once you’ve eaten something you’ll actually start to feel better. We have great chefs who will make healthy and tasty meals for you that will provide all your energy needs. Everything is cooked from fresh and we use plenty of vegetables and fruits. Please let us know in advance if you have any special dietary requirements as our chefs are practiced in creating vegetarian, gluten free or even vegan menus. Take some time to look around and take in the varying scenery its different every day. Get to know your crew and learn some Kiswahili and about them and life in Tanzania. You'll find that they are a very friendly bunch with a great sense of humour so you’ll have a fun too. Having fun whilst climbing creates a positive attitude too – you will need this to be able to complete your summit bid. We are committed to keeping our lovely mountain in the best possible condition. It's essential that no rubbish is left on the mountain anywhere. Indeed, it's illegal to leave anything. Please be careful during your trek and at camp not to leave any rubbish around. The park rangers check each campsite before our crew leave. Don't worry though you will be able to start your trek before the crew have completed their packing and cleaning of the camp. We provide a trash bag at camp for you to deposit all the rubbish that you have built up during the day. All our trash is carried off the mountain and disposed of responsibly in Moshi. You will be provided with at least one private flush loo and loo tent whilst on your trek and there are long drop loos at all the camp sites on the mountain. Please make sure that you use only loos at the campsites - please do not use the bushes as this despoils our mountain and makes the campsites unpleasant for other trekkers. While you are on the trail you may have no choice but to use bushes or behind rocks which is fine but please don't leave any paper or other products. Sadly, behind most good rocks/bushes there is a pile of paper that has been left by irresponsible trekkers and the park cleaning crews have a grim job to do. Also keep at least 20m away from any streams. Please bring and use biodegradable soap for your personal use and if you dispose of your washing water keep it at least 20m away from streams. Please be good to your crew they do important and hard jobs and are lovely, helpful and kind people. Get to know them - you can and share your ideas and knowledge. Yes - you have to be responsible for your own health and well-being too ! Make sure you wash your hands before eating anything and always after the loo. Tell your guide immediately if you don't feel 100% for any reason or if have any worries or concerns about the trek or any other member of your team.